The episode is called, "Phat Johnny", and it starts off with Johnny Test telling a comic book salesman that he should try a dancing video game for exercise. The salesman, visibly upset, asks Johnny if he's calling him fat and tells him he has a "glandular problem", to which Johnny replies, "you have a fat problem too" leading the salesman to run crying from the store. Next Johnny is transported to an island where he meets up with his nemesis Bling Bling. His nemesis is fat, and he's working on creating an" abtastic muscle bar" that will both make him muscular and hence attractive to his crush, Johnny's sister Susan. Both he and Johnny eat the bar and muscle up, but when Johnny is transported back to his home instead of muscled he finds himself fat - the bar has malfunctioned. His best friend Dukey (a dog), recoils in horror on seeing him, and when Johnny sees his new fat self in a mirror, he screams in horror at the reflection. Johnny heads back to the island to see Bling Bling where he's told that it'll take a long time to fix because the lab technicians all ate the bars too and they're all fat now too and as an apparent consequence, they're also now all klutzy idiots who fall down when they inadvertently bump into each others' stomachs. Johnny, desperate, asks if he can take monkey growth hormone to help slim him down and his nemesis says not to be ridiculous and instead places Johnny in his mom's girdle. Johnny gets ejected from the girdle (by the force of his exploding fat), and that launches him back into the teleporter and then back to the comic book store where upon landing a kid points at him and says, "Hey look at Test, he's fat, and that's with an 'f', not a 'ph'" and then all the other kids laugh. Next Johnny heads home to see his sisters. They're geniuses. He's hoping they can help. They laugh and point at him when he walks in the door. They describe Johnny's problem as, "a big problem, emphasis on big". Their plan is to make Johnny look cool even though he's fat. The plan works. 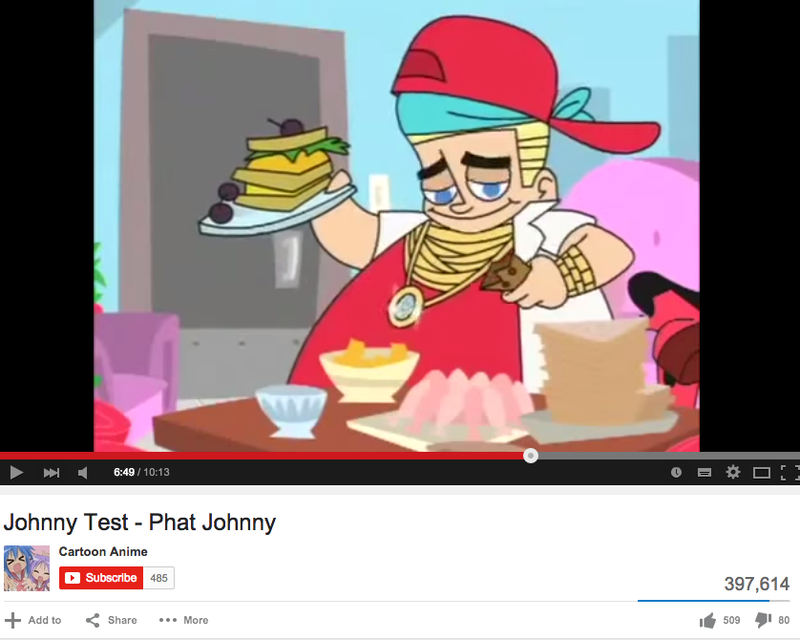 He becomes "Phat Johnny" and raps about his fatness. Then the show cuts to him in his dressing room eating gluttonously. Next they reiterate the overarching theme of the episode - Johnny made fun of a fat guy and made him sad, and so karma made Johnny a fat guy and now he's sad. So Johnny does something nice and donates money to a cat shelter, and then gets mad at karma for not "fixing" him. Ultimately Johnny gets teleported back to the island where he uses the bottle of monkey growth hormone to get thin again. So what do you think this episode taught kids who watched? "it ranked as the #1 broadcast program in Girl 2-11 (garnering 2.2/10), and ranked as the #2 broadcast series in Kids 2-11 (gaining 2.3/11 in the process) and Girls 6-11 (2.4/11), and ultimately ranking #3 in Kids 6-11 (receiving 3.0/14). Its second season received a slightly more number of viewers in average in the United States: 2.6 million viewers per 2nd season episode. Its 3rd season's average number of viewers in the United States was 3.1 million viewers. Its 4th season got an average number of viewers of about 4.3 million viewers per episode in the United States. Its 5th premiere attracted over 4.7 million viewers in the United States." And it airs in over 75 countries and 19 languages.